As I'm getting married in just two days time (yay!) 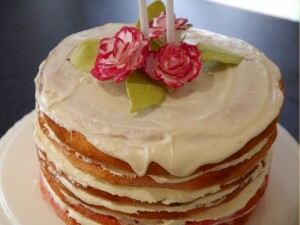 here's Part I of June's Tea Time Treats: Layer Cakes! Karen from Lavender and Lovage will kindly be publishing any entries added between now and the 28th June in June Tea Time Treats Part II on Lavender and Lovage. Jibber Jabber has chosen my fiance's (I promise this post won't be entirely wedding related!) favourite flavour: mint chocolate chip to make this glorious layer cake. As Jibber Jabber rightly observes this fresh flavour combination should certainly not be the sole preserve of the local ice cream shop! 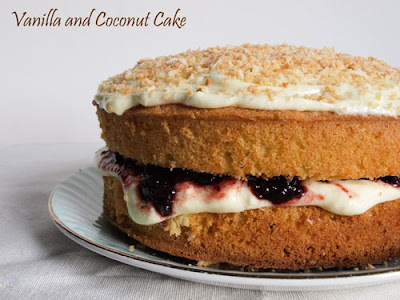 This next entry a scrumptious Vanilla and Coconut Cake was baked by FarmersGirl Kitchen for her mother-in-law's birthday and comes straight from the pages of newly published Clandestine Cake Club Cookbook which Janice brilliantly describes as containing a 'positive cornucopia of proper cakes'! My Tea Time Treats team mate Karen, from Lavender and Lovage has combined two of my all time favourite flavours in her delicious 'Secret' Baked Layer Cake: Scottish Rhubarb and Ginger Crunchy Steusel Cake. The secret? A layer of rhubarb and ginger jam combined with a layer of the streusel mixture baked on the inside. Now there's a secret that won't be kept for long as I've no doubt this would be very popular at any tea time table! Fold in the Flour (such a lovely cakey named blog!) has baked the Tea Time Treats table this gorgeous Hazelnut, Lemon and Blueberry Cake. Using spelt flour, ground hazelnuts and zesty lemon and decorated with a sweet creamy cheese icing plus a generous handful of juicy berries! Just perfect! To misquote those M&S adverts, this isn't just a carrot cake, this is Belleau Kitchen's Carrot, Flax and Spelt Layer Cake! 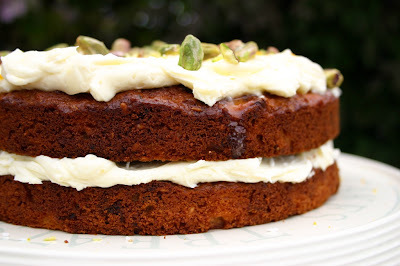 A super healthy version of the the classic, Dom describes this lovely cake as more of a health bar - does that mean seconds are perfectly acceptable? Fishfingers for Tea, inspired by the treats on offer at their local Coffee Shop, has baked this fine looking Vanilla and Blueberry Layer Cake, complete with blueberry compote and lashings of soft, sweet buttercream. Deee-lish! Baked for a (very appreciative I'm sure!) colleague, The More Than Occasional Baker sends us a crackin' Carrot Cake with Orange Cream Cheese icing. I suspect this classic would be my 'desert island' disc cake! 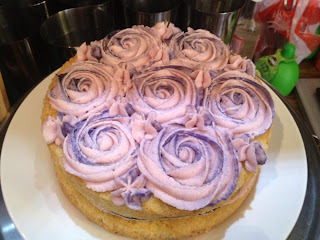 This next cake is just so pretty with swirls of blueberry roses decorating a vanilla layer cake. Charlie's Cakes cooked a punnet of blueberries in a little water, then pureed until smooth before creating a delicious curd for this lovely Blueberry Rose Layer Cake! 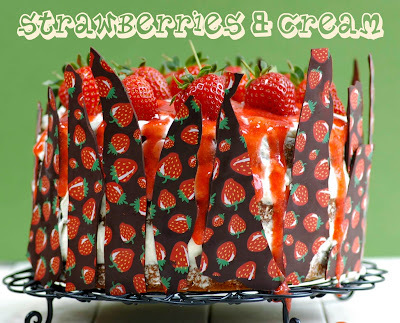 Six entire layers belong to this next entry: Kitchen of Kiki's Ultimate Strawberry Cakes. Kiki has spent two years perfecting this fabulous recipe! Utterly Scrummy Food for Families describes how well the flavours marry (sorry!) together in this next yummy bake, a Banana Cake with Lemon Curd Filling: 'the zesty lemon curd helped temper the sweetness of the banana cake and the richness of the whipped cream'. It's no wonder the recipe is requested over and over again! I can count at least six layers in this next cake: a Rose Tinted Birthday Layer Cake baked by Mummy Makes Cakes for her daughter's second birthday. Complete with vanilla icing, white chocolate and homemade sugar roses! To celebrate the end of exams (a very fine excuse to switch the oven on) Lottie from Lottie's World of Cakes has beaked this gorgeous White Chocolate, Blueberry and Lemon Cake. 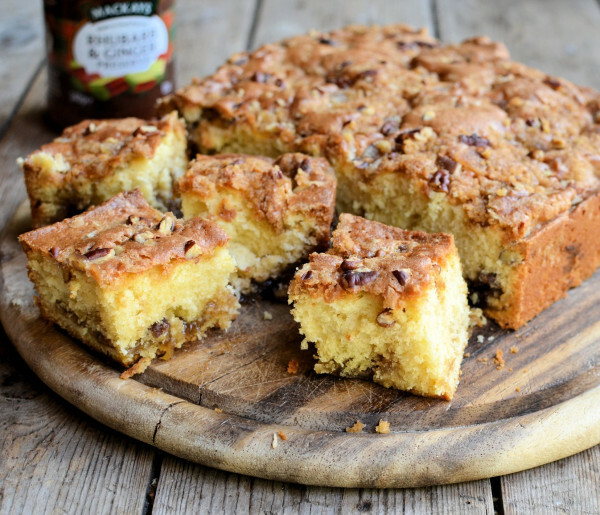 Baked using three of Lottie's favourite flavours this is certainly worthy of an A*! As Hungry Hinny points out in the introduction to this next entry, Red Velvet Cake is 'definitely a dessert with the wow factor'. Wow Factor, X Factor, this cake is certainly a huge hit! Two words describe this next cake: 'Oh! My!' as that was my exact reaction upon clicking on My Golden Pear's Strawberry and Cream Layer Cake. Just look! Look! 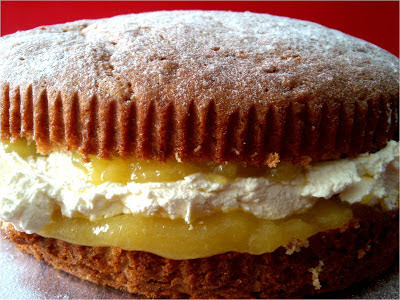 Complete with a lovely trip down memeory lane right back to the 1970s, Anna May, Everyday has baked this luscious Lemon Layer Cake for the Tea Time Treats Table- zingy, creamy and downright delicious! 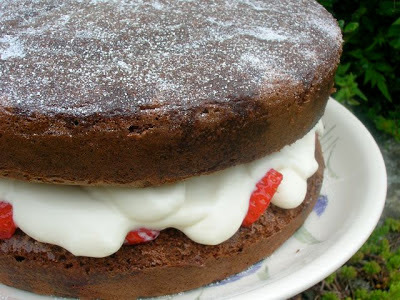 Choclette from Chocolate Log Blog has brilliantly named her choc-tastic cake Chocadoodle Cake, otherwise known as Chocolate Genoese with Minted Strawberry Cream! A really lovely summer layer cake complete with juicy local Cornish fruit! And our final entry for Part I of the round-up is I Cook with Butter's scrumptious White Chocolate Passion Cake. This recipe is taken from the highly recommended new book by Peggy Porschen and seemed very fitting to finish with with the key ingredient being passion fruit! There is still plenty of time to enter: simply follow the instructions right here to add your cake to the line up! 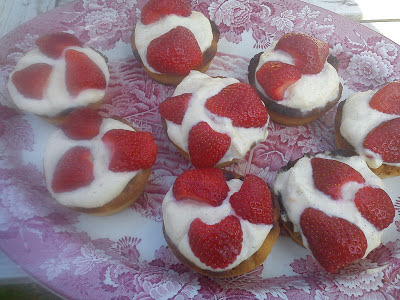 Pop over to Lavender and Lovage where Karen will have Part II of June's Tea Time Treats at the very end of the month. Karen is also hosting July's Tea Time Treats. Thanks for the lovely round up. I hope you have a beautiful day and many years of wedded bliss. Happiest Wishes for your wedding day, and loads more happiness and joy in the years ahead. Oh, Kate - what an incredible collection! Lovely cakes, Kate. Huge congratulations on your wedding, hope the cake is up to standard! Gorgeous cakes - and congratulations on getting married, I hope you will share a picture of your wedding cake with us!